Future holds great promise for urban mobility. This is a topic that comes up time and time again in several sectors and includes not only transport within the same megalopolis, such as Mexico City which covers 573 sqm, but also transport from one city, or metropolis, to another. In Europe for instance, we’ll soon be able to travel from Milan to London in about two hours and from Paris to London in just less than an hour. Any vehicle that manages to reach certain speeds will have to do so by air and, in order to be future-proof, it will have to guarantee high efficiency in terms of consumption and emissions. One of the main reasons why Clean Sky, the European Union's platform for studying and developing solutions for the future of aviation, features RACER (Rapid And Cost-Effective Rotorcraft) by Airbus Helicopters as its flagship project. The RACER is a technology demonstrator, a so-called hybrid aircraft. Its shape immediately resembles a helicopter, but it is also equipped with uniquely shaped wings that have two counter-rotating propellers (one in a clockwise direction and the other counter-clockwise) directed towards the tail. These wings have an eminently attractive shape and are vaguely reminiscent of a Formula 1 wing. "The RACER is 50% faster than a traditional helicopter, but has lower costs, and brings together several new technologies," says Tomasz Krysinski, Head of Research and Innovation at Airbus Helicopters. Krysinski - an Aerospace Engineer with a career spanning more than 30 years in the field of technological innovation, mostly devoted to air transport and helicopters except for a brief stint in the automotive industry - certainly knows how to recognize a highly technological product at first glance. The RACER is an avant-garde project even for him and that’s why he counts on allies with high technological capabilities. "I believe that Avio Aero is the perfect partner, simply because it pursues a similar design objective to ours, sharing data and technical experience to achieve the best design solution". As announced at the last Helitech in Amsterdam, the first goal has already been achieved with the RACER passing the Preliminary Design Review (PDR). As Krysinski explains: "This is the phase of defining the design of an aircraft’s subsystems and components, marking the beginning of the detailed design and production phase". GE Aviation Integrated Systems based in Hamble in England is also teaming up with Avio Aero for the RACER. GE specializes in the design and production of aeronautical structures, wings and fairings with latest-generation materials intended for aircraft of all sizes. The RACER Titanium cradles are designed by the Engineering team in Hamble: "they are a critical component, connecting the wings to the lateral gearboxes, which Avio Aero is responsible for, and they’ve already been launched into production", Krysinski explains. Typically, a complex component such as the titanium cradle would be built by assembling several metallic parts together, which is not very cost and weight efficient. "This is the first time we’ve ever designed such a complex cast component, that has lead to a reduction in weight, part count and costs," explains Paul Mandry, Astral Programme Manager at GE Aviation Hamble. "We are using 3D printing technology to produce the patterns from which the final molds are manufactured as part of the centrifugal casting process.” Paulo Mancilla, Director of GE Aerostructures P&L and Engineering at Hamble adds that the combination of 3D printing and casting allows his team to create even more complex and advanced aeronautical structures. "These technologies will also allow us to remarkably reduce costs and offer structures which perform better because they are lighter”, says Mancilla. Representing Avio Aero in Amsterdam, but also of the GE Aviation Hamble team, Alessandro Bordoni, Head of Helicopter Transmissions System Engineering, had a lot to do in listing all the RACER’S design, mechanical and material innovations during the joint conference with Airbus. He began with Avio Aero's crucial role in the demonstrator, concerning both the design and production of the entire system of rotor transmissions on board the aircraft. The relationship established between Avio Aero and Airbus Helicopters is an unprecedented collaborative model in this field. The main rotor transmission was conceived and developed together by the Italian-French engineering teams: "the transmission system of a helicopter is vital because all the motion is transferred from the main gearbox, which is under the rotor, to all the rotors determining the performance and total propulsion”, says Bordoni. Considering that the RACER has two propellers on its wings, each capable of generating power similar to that of the GE Catalyst engine, it’s easy to see how both complex and paramount this system is. “We are directly responsible for the design and production of the two lateral gearboxes that supply power to the propellers of the wings", explains Bordoni, "and we are also responsible for the two accessory gearboxes that supply power and electricity on board, and for the main gearbox’s high-speed first reduction stage". 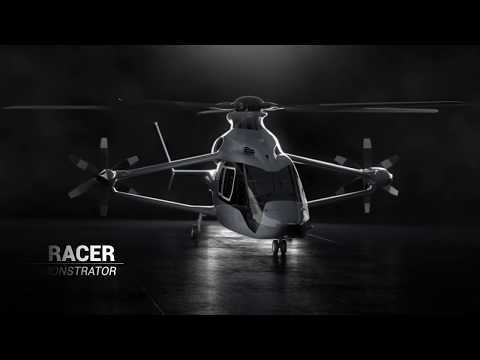 "An unprecedented collaboration, the main rotor transmission was conceived and developed together with Airbus and we are responsible for the design and production of the lateral gearboxes"
That's not all, because thanks to the experience gained on the GE Catalyst program, the RACER will also have 3D printed components. Additive manufacturing is increasingly sought by Avio Aero engineers in order to guarantee the typical advantages of weight, speed and freedom of design, especially when it comes to new generation aircraft. "The RACER, next to the two lateral gearboxes, has heat exchangers for which we are responsible. These will be made from additives, as this allows us to design them to adapt their shape around the two lateral gearboxes on which they are mounted". Gian Mario Bragallini, Avio Aero Third Parties NPI (New Product Introduction) Engineering Leader, together with Bordoni, is working more and more actively on the key components of the RACER. Bragallini, just like Krysinski, underlines once again the importance of developing new materials: "the gears that make up the transmissions for this aircraft have been designed to withstand very high temperatures and extreme physical stresses. In fact, we’ve built them with new super alloys which have never been used before and are capable of performing even in the event of an extreme oil-off condition". As Bragallini explains, these are the limit conditions in which an aircraft - especially if it will be used not only for private transport but also for rescue and humanitarian missions like the RACER- may find itself facing extreme operating conditions. In these cases, the oil (vital for the operation of engines and transmissions) may run out: the materials used by Avio Aero ensure that the RACER is able to complete the mission, facing high temperatures and ensuring to bring the people home safely. The first prototype of the RACER is expected to be built by the end of 2019, and by the following year it is expected to complete its first 200 hours of flight testing. Avio Aero’s components will be built at Rivalta di Torino and some of them will be then tested at the Sangone Experimental Center. "It's an ambitious, hyper-technological program of work, and we're glad that Avio Aero has undertaken it with enthusiasm," said David Alfano, Program Director for Airbus Helicopter in Amsterdam.